The volunteer-run Bluebell Railway is UK's first standard gauge passenger line, opened to public service in 1960. The steam trains now run through 11 miles of Sussex Countryside from Sheffield Park, Horstead Keynes, Kingscote to East Grinstead. 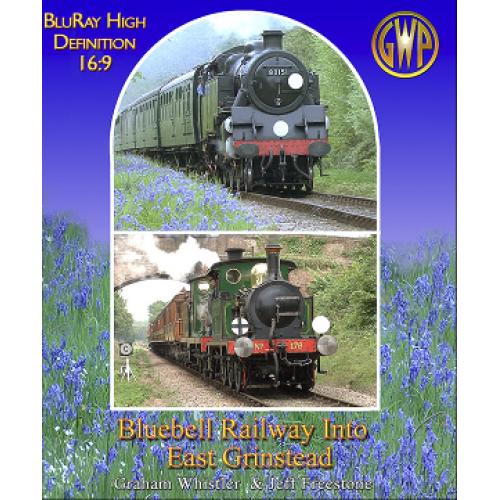 After many years of sheer determination and hard work backed by serious fund raising, early in 2013 the Bluebell Railway was reconnected to the main line national rail network at East Grinstead. There is coverage of the clearing of over 90,000 tons of rubbish from the Imberhorne Cutting and the final laying of track into East Grinstead. Seeing the first train on 23rd March 2013 and opening of the railway in a snowstorm! A few days later see the first special excursion mainline train run into the newly connected railway at East Grinstead. Our film includes plenty of steam action and a wide variety of large and small locomotives hard at work. Included is full coverage of the Giants of Steam Weekend in the Autumn of 2015. Filmed and edited by GWP with the full co-operation of the railway. Also available as a DVD. Special thanks to Davis Allen who kindly provided us with some vital extra material. Running time total - approx 75 minutes.